Drop zones, mudrooms, utility rooms, entry halls, “places to toss your junk.” Whatever you choose to call them, these spaces have been around for ages and show up in many vintage and modern floor plans. In the past, they used to be dank and dark back corners to toss muddy boots, but now they are finally getting the attention and makeover they deserve. Gone are the hall closets overflowing with coats long outgrown and forgotten Christmas presents. Gone are the times of leaving your shoes in a hazardous pile in front of the door, waiting to trip an unsuspecting victim. Gone is the disarray of backpacks, mail, dog leashes and knick-knacks that clutter your home to the point of embarrassment. Having a dedicated, organized and stylish drop zone for all of your daily needs is becoming a big trend in home décor. Whether you have a specific built-in space for a mudroom or just a hall near your front door, anyone can easily make over their existing space to provide functionality and fashion. You can go big, crafting built-in nooks and cubbies, or you can have the same affect by adding a cute bench, a basket for shoes and a couple of wall hooks. Either way, this small corner of your house makes a big impact on your life. “Organized life, no more strife,” as I like to say. Having a dedicated space to hang your keys, sort your mail and keep your shoes really makes a difference in the flow of your day. Instead of missing your big meeting because you couldn’t find your keys or resorting to tying a piece of rope around your dog because his leash is tangled somewhere in a pile of unsorted junk, you can quickly and easily grab what you need and be on your way. As you can see, you can get as creative and organized as you want! Having a message center in your drop zone to pin important reminders or leave messages for family members is a great way to keep everyone connected as they go in and out. Another cool feature that a lot of home owners are adding is a docking station to charge all your electronics, from smart phones to iPads, so they are juiced and ready to go when you are! If you have children, a great idea is to give each child their own hook and cubby to keep backpacks, coats and shoes within easy reach. Baskets for scarves and other frequently used items and trays for wet shoes are also extremely effective in keeping things clean and organized. Even just a table with a bowl for keys and a folder for mail can really make a difference. 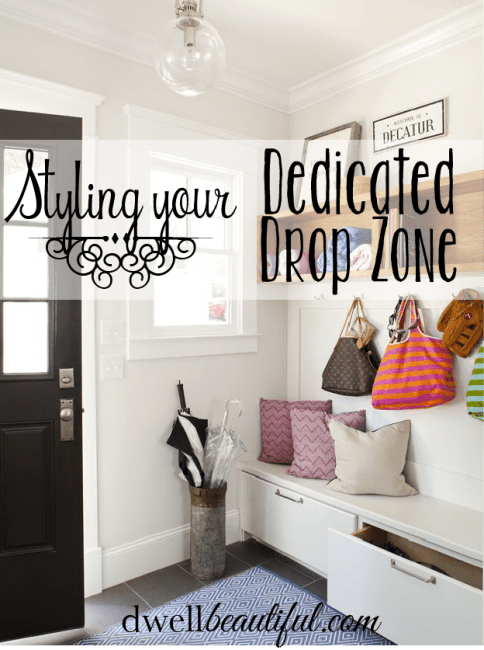 Do you love the idea of a functional and stylish dedicated drop zone in your home? If you have tips or pictures of your own spaces, I’d love to see.